When Stranger Things released on Netflix in July it immediately exploded online, but I was not at all interested in the pitches people kept giving me. “But J, it’s like the 80s in TV show form!” I heard regularly. The thing is, I wasn’t even alive in the 80s. I may have grown up on 80s and 90s media, but even so the show people were trying to get me to watch did not interest me. And then I watched it. All I can say is people are just incredibly bad at describing media. Stranger Things may well be a distillation of the 80s, but that isn’t all it is. It’s also an incredibly well acted piece of science fiction/horror with an old style but a modern outlook. Stranger Things is absolutely not nostalgic – in fact it seems to actively revel in tearing down the archetypes of an 80s style show and uses our expectations of them to do so. OK, so I’ve told people they’re wrong, but I’ve not yet told you what the show is even about. Stranger Things tells the story of a small town in America following the mysterious disappearance of a young boy. We primarily follow three of boy’s friends as they search for him, meeting the mysterious and powerful girl Eleven in the process. But part of the beauty of the show is how it handles the various plot threads of the show; we also follow the story of a young girl juggling the needs of her new boyfriend and her best friend among many other much smaller stories that know exactly what they bring to the plot and when to end. See, it’s a little tricky to describe Stranger Things. Is it an 80s style alien invasion show? No. Is it a horror? Not really. Is it a thriller? Getting closer, but no. Stranger Things clearly knows exactly what it wants to be, and doesn’t care if you struggle to label it. We are thrown from a high school drama featuring stereotypical bullies to a life-or-death chase scene with secretive agents and terrifying inhuman entities, and yet it all feels perfectly natural. While the show may harken back to the 80s, another modern aspect is the design. Everything about the set design, makeup, and graphical work is masterful, and shows off exactly how much can be done using current techniques. Every shot is crisp and clean, and every part of the slowly darkening design is exceptional. I feel quite safe in saying this is some of the best graphical work I’ve seen done in a TV show, and with contenders like Game of Thrones and The Walking Dead this is quite the feat. The acting is the highlight for me though. Every one of the show’s surprisingly large cast bring in an excellent performance. Winona Ryder as Joyce Byers appears in every episode yet feels criminally underused, and David Harbour acts a career-best as Chief Jim Hopper. 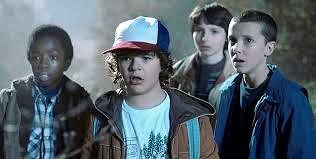 The real stars of the show however are the child actors; Finn Wolfhard puts in excellent work as the show’s lead, but Millie Brown steals the show as the mysterious Eleven. What really amazes me is how fresh and untested some of these child actors are, but the gamble really pays off as they pull the entire excellent piece together. As I think you can probably guess by now I really enjoyed Stranger Things, and thoroughly recommend it. If you or a friend have Netflix give the first episode of this 8 episode series a shot, you’ll know straight away whether this show is for you.